A black bear wandered through your kitchen when you weren’t home. This most likely occurred before your house was built – unless you leave your door open. 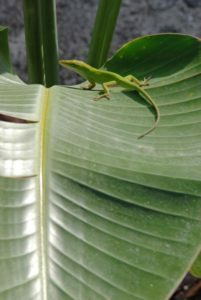 Our urban areas, similar to the remaining undeveloped areas, once hosted natural areas with a wide diversity of native flora and fauna. The pressure on the environment continues as parcels covered with native vegetation are cleared and developed. Meanwhile, houses are typically built out to their maximum allowable footprints and leave less green space and little if any native vegetation. There are tens of thousands of suburban yards in developed areas that have space available for gardening to attract wildlife. Subtract area covered by roofs and swimming pools and pavement used for driveways, walkways, and patios, to find the space that remains for potential wildlife habitat. 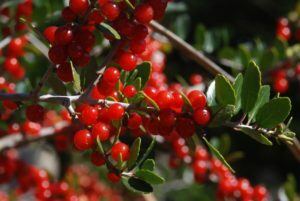 Food – native plants provide nectar, seeds, nuts, fruits, berries, foliage, pollen, and insects eaten by a variety of wildlife. Feeders supplement these food sources and can attract multiple birds either at the feeder or on the ground gathering the scatterings. Water – animals need water to survive and some need it for bathing or breeding as well. Providing water is more beneficial than providing food at feeders. Keep the water clean and in birdbaths provide a textured surface and a maximum depth of three inches. 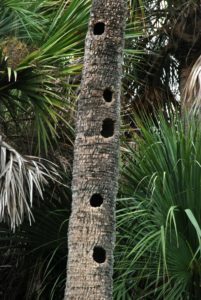 Cover – wildlife needs places to find shelter from bad weather and places to hide from predators and from which to stalk prey. This may include dense shrubs, a portion of a dead tree or a few decaying branches tucked out of sight. Places to raise young – wildlife needs resources to reproduce and keep their species going. Some species have totally different habitat needs in their juvenile phase than they do as adults. Sustainable practices: how you manage your garden can have an effect on the health of the soil, air, water, and habitat for native wildlife as well as the human community. 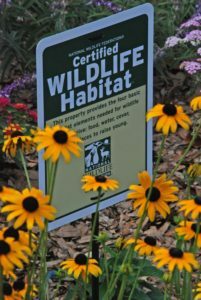 Use your garden spaces for habitat infill and encourage your neighbors to join you in becoming a Certified Wildlife Habitat (see resources). Consider conversion of all or portions of a monoculture lawn that requires chemical sprays, fertilizer, and large amounts of water to plants that benefit wildlife. Native plants are readily available. You may theme the gardens as butterfly and/or pollinator gardens or perhaps a rain garden for moist areas that collect storm water. When designing your garden remember to tuck in seating so there is a place to sit quietly and enjoy the wildlife attracted to your garden. If you are in bear country, please bring a bell. Oh Citrus, Where Art Thou?